There are a lot of thefts happening these days where costly phones and devices are being stolen, so you have every right to be insecure and cautious about your mobile devices. But then there is some good news for the android users now, you can easily find or at least track the last found location of your android device. Every android phone carries a unique IMEI no (International Mobile Equipment Identity Number) which will be printed at the back of your device. IMEI number is very useful in finding the location of your phone. No matter if your phone thief has already changed your SIM and using a new SIM, or even if the phone is switched off, with the help of IMEI number your phone can be traced and immediately blocked by the service provider from using it. 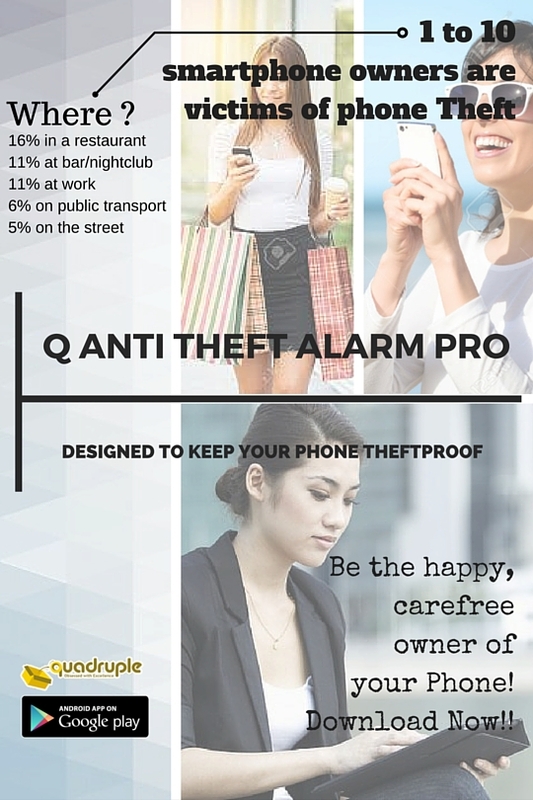 Q-Anti Theft Alarm is a newly released app that allows tracking your phone using IMEI number. The app sends SMS alerts to your emergency contact in case any anonymous movement is detected on your phone. A loud alarm is triggered if anyone tries to move your phone. If the alarm is not deactivated within 15 seconds, SMS alerts are sent to the emergency contact to notify theft or burglary. These SMS alerts shall contain information such as the mode at which the phone is lost (eg: charging, travel), IMEI no of your device, SIM no which is automatically detected by the app when it is installed & Google map link of your phone’s last found location if a GPS is available in the device.